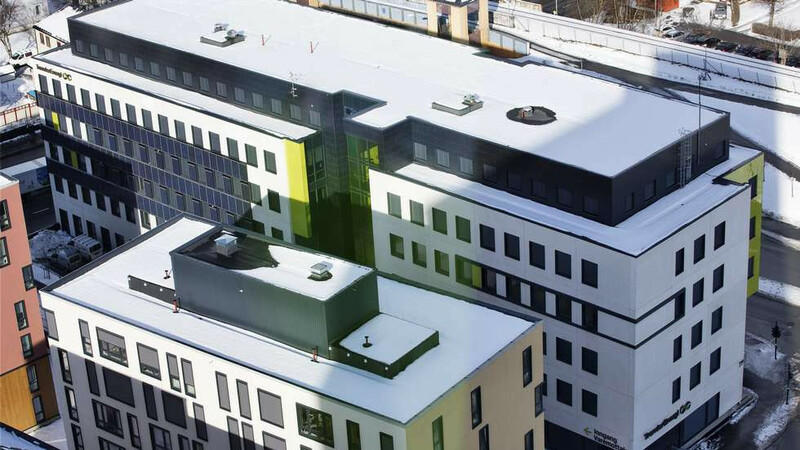 The Lerkendal case is a seven-floor office building for the utility company Trønderenergi, located in the city of Trondheim (63.41°N, 10.40°E). 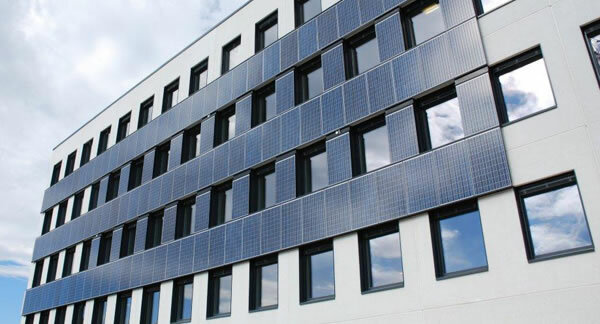 The PV panels are aesthetically integrated into the south- and west-facing facades, but it is technically not a BIPV system, as no building materials have been substituted. Lerkendal system, Trondheim. 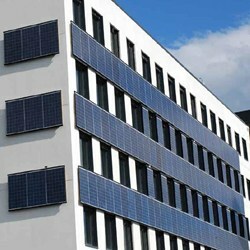 The south-facing PV facade is seen to the left, at partial shading conditions. (Source: Adresseavisen AS, adressa.no, published 10.04.2014). The system is instrumented for monitoring of electricity production. PV production from each string is analyzed based on available data from the inverters. 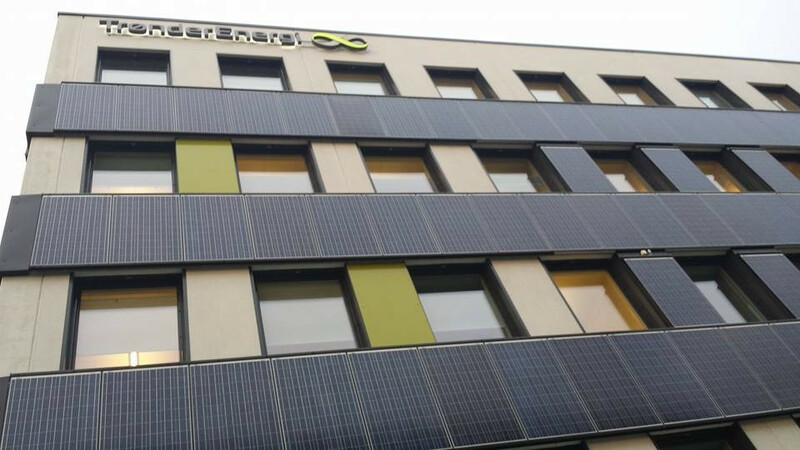 The Lerkendal PV system consists of 200 m2 of poly-crystalline panels (13.7 % efficient), with 112 panels on the south facade (8 strings/4 inverters) and 9 panels on the west facade (1 string/1 inverter). The PV system was commissioned in 2012. When the PV system was commissioned in 2012, it had been designed according to the expected irradiation and shading conditions from the surrounding buildings at that time. One year later, a new 21-floor hotel was erected nearby. This has resulted in additional shading of the south-facing PV panels, and shading has significantly affected the solar production and the performance of the system. Performance simulations and system evaluations have been performed by S. Hårklau, C. Good, et al. (see references below). For the south facade, the simulations showed an annual reduction in global irradiation of nearly 30 % due to shading from the surrounding building obstructions. Based on PVsyst simulations and the first year of production data, the PR of the top strings of PV panels least affected by shading was estimated at 0.68, and the bottom strings 0.52. The estimated annual specific production for the complete system was reduced from 530 kWh/kWp the first year, to an average of 406 kWh/kWp for the next two years due to increased shading. Due to low solar elevation angles, shading is most severe during winter and does not affect the panels during the summer months (May-July). The largest uncertainty in the simulations and estimation of PR is the solar radiation resource, where local measurements showed substantial deviation from the Meteonorm data used in the simulation. Long term quality-checked ground measurements of irradiation are generally scarce in Norway. S. Hårklau, Elektrisk energiproduksjon fra et delvis skyggelagt solcelleanlegg i Trondheim – Simuleringsforsøk og overvåkning av faktisk produksjon. Master Thesis, Department of Electrical Power Engineering, NTNU, Trondheim (2014). C. S. Good, et al., “Optimization of solar energy potential for buildings in urban areas – a Norwegian case study”, Energy Procedia 58 (2014), pp. 166-171.